We’ve just finalized details for the Fall 2014 Hydra Camp and registration is now open. The course will provide an introduction to Ruby, Rails, the Hydra technology stack, metadata management using both XML and RDF data models, test driven development, and collaboration on open source software projects. We are also excited that this will be our first camp to include a preview of Hydra using Fedora 4. This intensive four day course provides an overview of the skills and tools necessary to develop successful Hydra solutions once you return to your home institution. $50 – Early Bird Discount! As a special incentive, we are offering a $50 discount on registrations made by July 15th, 2014 – just choose “Early Bird Registration” on the sign up page. The course will run from 9am-5pm each of the four days: Tuesday, August 26th through Friday August 29th. Friday afternoon is reserved for Q&A and student topics, so folks needing to leave early for Labor Day weekend travel can do so. At DCE, we are committed to the open source principles of transparency and sharing. We’ve made a few changes to this year’s rate sheet which we hope embody these ideas. Any project we work on that is willing to license deliverables under an appropriate open source license will be eligible for our Open Source rates, which reflect an average 20% discount over our base work-for-hire rates. This reflects the reality that it’s actually more expensive for us not to share our work. Managing the overhead of tracking licensing on individual projects ends up costing us time and money that we would rather not have to charge for. Clients who choose to work with us on a strict Time-&-Materials basis will be eligible for a 10% discount. Committing to fixed cost projects involves a significant amount of risk and uncertainty for us, especially in light of the flexible and evolving requirements that govern most projects. We appreciate clients who actively engage in managing deliverables with us under a time-and-materials agreement. This is our way of recognizing their willingness to share the risks involved in producing high quality software. We are a small company and cash-flow is a concern for us. Waiting for payments to come through Accounts Payable departments sometimes gives us grey hairs. Clients who pre-pay (on smaller projects) or agree to net-5 terms (on larger projects) will be eligible for a 5% Early Payment Discount. For Open Source work, this means that our base rates remain unchanged again this year. In addition, we’re hopeful that a broader number of partners will be able to benefit from our simplified discount structure. I was at Case Western Reserve University last week leading HydraCamp. Many of the folks attending were from institutions new to Hydra and eager to get repositories up and into production – and they had lots of questions about setting up Hydra in production environments. As we progressed through the development content that the course covers, it became clear that the Hydra community hasn’t spent as much time describing the production operation of Hydra nearly as well as we have covered development topics. 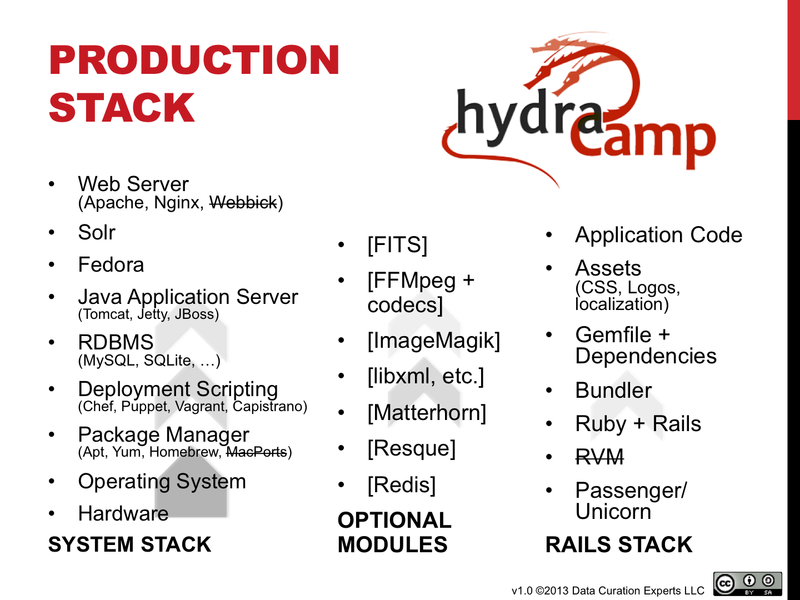 Once you have a Rails development environment setup, the instructions in the Dive into Hydra tutorial will get a development environment up and running in less than a morning (as proven by our HydraCamp attendees!) Our typical development environment simplifies many setup and configuration decisions by relying on a handful of useful rake tasks and the installation of hydra-jetty which provides a pre-packaged java server with Solr and Fedora pre-installed and configured for development environments. SYSTEM STACK represents the hardware, operating system, and core resources that systems and support folks often have strong opinions about, especially in regards to installation, patches, and operational support. OPTIONAL MODULES fill in the gaps between your core infrastructure and your Rails application. These are mostly linux utilities and rails gems that give you access to system tools and resources from within your rails apps. They might include file characterization and rendering utilities and/or authentication and authorization libraries that help Rails talk to the rest of your environment. Even this picture isn’t complete: “Hardware” encompasses a lot of detail all by itself – disk and memory size, processor cores, network configurations, etc. ; “Bunder & Gemfile + Dependencies” encapsulates a lot of complexity; nearly every bullet point requires some time and effort to install correctly. So, even though the slide isn’t exhaustive, it gave us a place to start talking. And I think we began some good conversations. We’ve been doing a lot of thinking at DCE about how to make Hydra deployment easier and more reliable and we plan to share more of our thoughts and ideas as they evolve over the coming months.